OVER 100 members of staff at Frome company Butler Tanner & Dennis have been told their jobs are at risk after the company went into administration. The company on Claxton Road specialise in the production of colour books, fine art printed projects, brochures, high end magazines and marketing literature and the 100-strong workforce was addressed last week by CEO Gerald White where they were told Butler Tanner & Dennis were going into administration and that the future is uncertain. 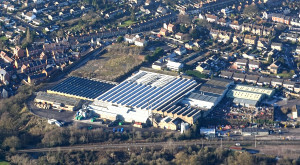 Gerald White said, “After spending months considering the future of the business, various lease options for our existing site and searching for alternative appropriate premises from which to print, we have unfortunately been left with no option but to put Butler Tanner & Dennis Ltd into administration. Councillor Mel Usher, leader of Frome Town Council said, “The news that Butler Tanner & Dennis is going into administration is very sad indeed. The company has been an important part of Frome’s community and economy for many years. The company has had an illustrious past having first become part of the town in 1845 when they opened their first printing press in Bath Street, Frome. In 1935 the first Penguin paperbacks were printed at Butler Tanner. Ten titles were published simultaneously, including ‘Ariel’ by Andre Maurois and novels by Ernest Hemingway, Eric Linklater and Agatha Christie. They cost sixpence each – the same price as a packet of cigarettes. In 1951 50% of Butler & Tanner’s directors were women with much of the workforce coming from Frome. The company made a successful shift from general to educational publishers. In 1976 ‘The Governance of Britain’ by The Prime Minister, Harold Wilson, was printed. He came to Frome to sign copies for a book club. More recently, the company produced a new Delia Smith book and reprints of Jamie Oliver books and as recent as 2001, profits in the month of November exceeded £1million. The directors of Butler Tanner & Dennis Ltd will now appoint Richard Rones of Thornton Rones as administrator following court approval and will be informing customers, suppliers, creditors, debtors and other third parties shortly of what happens next. It is expected that Thornton Rones’ appointment will take effect from Friday 23rd May.